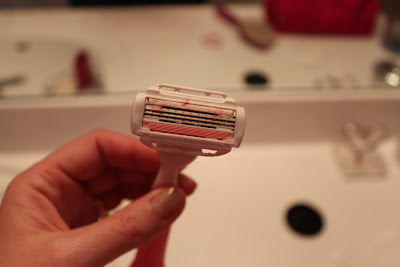 Women on a Mission: Mom Edition: Shavin' my Shirt & Sh-tuff. Well, Friends, if any of you live anywhere besides Minnesota, you are probably well into summer. But we just got a few inches of snow. I am not making this up. And I am fed up. I can hardly even be funny about it. I’m used up. The sarcasm is too dark to put in a family-friendly blog. We’re supposed to have spring-ish weather by Sunday, but even Shaun said he’ll only believe it when he sees it. I was super glad when the Boston Bomber Suspects were tracked down. The kids were sick that day, though, so I was at the doc’s office and Target (getting clear liquids) praying they didn’t throw up rather than watching the news unfold. We watched Men In Black II later and, if you recall, Michael Jackson (may he rest in peace) has a bit part in that and KD said, “that girl looks like a boy”. Too funny. Also, Tan Mom has done an impromptu bikini photo shoot, apparently captured by a passerby, and released by TMZ. I highly recommend it. Over the weekend, since we’re still wearing winter clothes, I put on a sweater of mine that had pilled up with those little balls. I remembered something on Pinterest that I didn’t pin (my M.O. 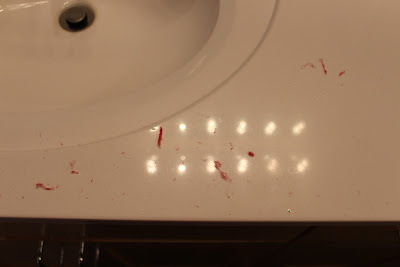 ), but thought I’d try anyway – shave the pills off with your razor. (I’ve never purchased one of the clothes shavers.) Hey what’s the harm? I’m already in a bad mood because of the weather; it would make no difference if I slashed up a sweater with the triple Venus razorblades. Of course, I tried this experiment with the sweater on me. 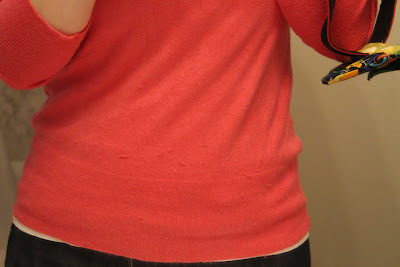 This may have been an advantage because my body helped to hold the sweater taut. But it also prevented me from shaving the back of the sweater due to my arms being the standard, non-Gumbi issue. WARNING: We completely waive any liability if you all go and cut yourselves (or ruin clothing) from shaving your clothes, especially while wearing them. Take on this task at your own risk, Friends. See right at my waist is the shave line where I stopped to take a picture of the progress. No more pills above the line. The ratty razor. As with most things, it's pink. This mess was all over the floor at my feet too. Super fun. I used the sticky clothes roller to pick it all up, which was awesome.